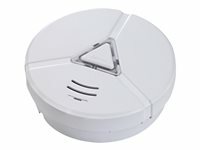 A smoke alarm detects fires in their early stages and can help save the lives of you and your family. This photoelectronic smoke detector features a microprocessor and comes with an integrated lithium battery that allows you to enjoy 10 years of continuous protection. Great!